and in our service to others in Cookham Rise, the surrounding areas and the wider world. There are three communities in Cookham — Cookham Village, Cookham Dean and Cookham Rise. 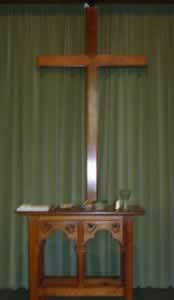 There are active and well-attended Anglican churches, with a good musical tradition, in Cookham and Cookham Dean, and at Cookham Rise Methodist we feel called to offer worship which is more informal and slightly 'different'. 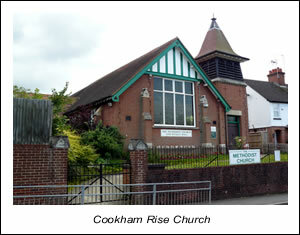 Cookham Rise Methodist Church is in Lower Road close to Cookham Rise railway station. 6.30 pm on the second and fourth Sundays of each month. On the fourth Sunday evening of each month there is 4th at Cookham — a chance to worship in a different and more informal way. 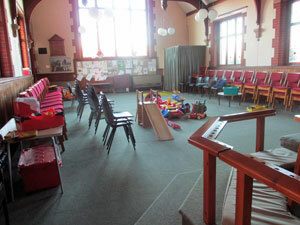 We have a Sunday Club for children aged 3 upwards that meets during the morning service; a crèche is also available. 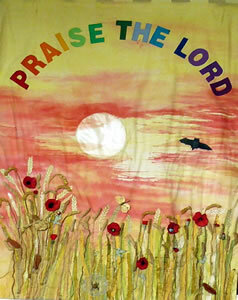 Our prayer group, Prayer & Porridge, meets weekly on Wednesday mornings from 8 - 8.30 am, followed by breakfast at Costa. The Ladies' Circle meets once a month on a Thursday afternoon. Each year the Church adopts and raises funds for a different mission 'project' somewhere overseas. This is led by the Ladies Circle. A Fellowship Group meets periodically for short Bible Study courses of 5 - 6 weeks. Please contact Mrs Connie Jeffery on 01628 - 662500 for details. A Soup & Sandwich Lunch is available every Wednesday from 11.30 am to 1.30 pm. There is a coffee morning and cake stall on the third Saturday of each month starting at 10 am; and church lunch on the first Sunday of each month at 12.30 pm — for anyone who would like a hot meal in good company. 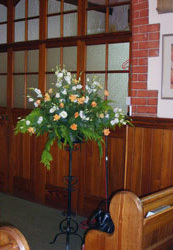 The Church's Wesley Hall and kitchen are available for hire by other organisations or for private functions. For bookings, contact our Lettings Secretary, Mrs Kathy Rickman on 01628 - 522797. Come & Play Indoor and outdoor play for under 5s and their carers on Tuesdays from 9.15 - 11.15 am and Fridays, 10 am - 12 noon. Dave's Diddy Disco Dancing to music for toddlers Mondays, 9.30 - 10.30 am. Boot Camp For fitness fanatics! Thursdays, 7.30 pm. With youth activities such as the local scouts and guides. With the 'Open the Book' scheme which takes Bible stories into primary schools. 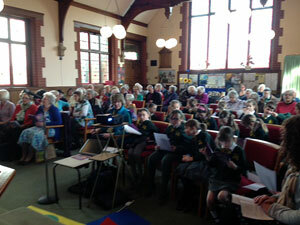 An ecumenical team reads and acts out Bible stories every Friday at Cookham Rise Primary School. 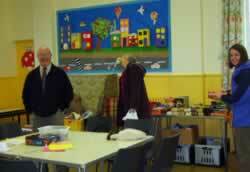 Helping at Elizabeth House (the Cookham Day Centre). There are strong ecumenical links in Cookham with involvement with, for example, the Social Action Committee and 'Christians in Cookham' — a monthly ecumenical lunch. The church premises are easily accessible to wheelchair users (via the entrance nearest the station). We have an Induction Loop system in both the church and the Wesley Hall for those with hearing aids. There is an accessible toilet. 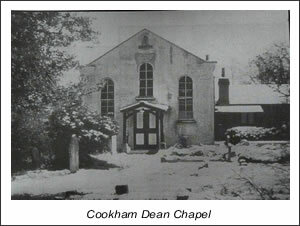 The first Methodist presence in the Cookhams was registered at Cookham Dean in 1838 when George Grigg, a Primitive Methodist Minister from Reading, braved the abuse and hostility of the locals, and conducted the first of a series of open air services on the village common. 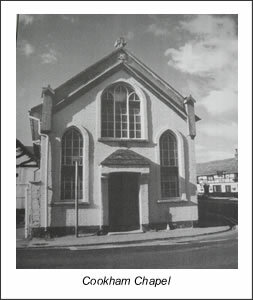 His courage and commitment inspired a group of worshippers who began to meet regularly in a member's house, before building themselves a little chapel in 1842, a building which they took down in 1858 and re-erected on a larger plot. The members of the little congregation which met in these two small chapels soon built up a reputation for devout worship and committed Christian witness. 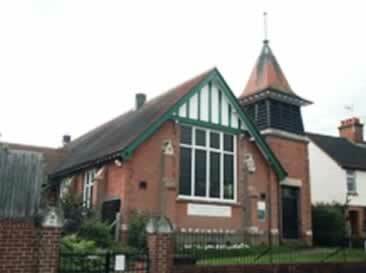 During these same years the Wesleyan Methodists, in the form of a Mission Band from the thriving church in Maidenhead, began holding open air services in Cookham village. They too quickly gathered sufficient support to enable the building of a small chapel (at the end of the village High Street) which was formally opened in 1846. Cookham Rise as a community did not then exist, but in 1845 the railway line from Maidenhead to High Wycombe was opened, and new houses gradually began to be built on the open land around the station called Cookham. By 1884 these housed a significant community. Robert Walker, a Local Preacher and member of the Maidenhead church, began to lead open air services there in the summer of that year. These quickly attracted a regular group of worshippers, and in November they were able to afford to build a small, corrugated iron chapel where, with encouragement and support from Maidenhead, their numbers grew steadily to the point where the chapel became too small, and the present fine, brick built church was built and, with much ceremony, opened for worship in 1905. 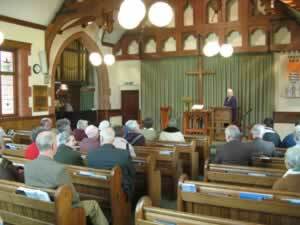 The chapel in Cookham village continued in use for more than 50 years. The congregation had never been a large one, and by 1910 the small building, the lack of facilities and the increasing cost of maintenance had become unacceptable. 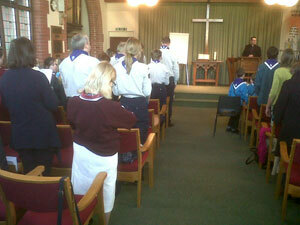 The congregation moved to the newer church at Cookham Rise. They carried with them two memorial windows, one to Robert Walker and the second to John Slack, Cookham's first Local Preacher, and these now grace the church entrance porch. Their former Wesleyan chapel is now the Stanley Spencer Gallery. The chapel at Cookham Dean continued in use until 1972, but by this time it too had become outdated and too expensive to maintain and repair. The small but loyal congregation dispersed to Cookham Rise and Maidenhead, and the chapel building was sold and converted into a private house. Meanwhile the church at Cookham Rise grew and flourished and a large hall was added in 1927. Building extra rooms downstairs off the Wesley Hall. 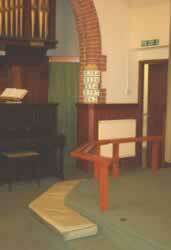 Replacing the stage in the Wesley Hall with storage space. Building a new path, a disabled entrance on the east side of the church, and a new toilet block. More recently, in 2013, the pews, installed when the church was built, were replaced with chairs, upholstered in red to pick up the red in the stained glass windows! The shades of the early Methodist pioneers have always lived on in the members of the congregation through a deep seated sense of mission and service among the local population, and in 2005, they rejoiced with the local community as they celebrated 100 years of worship and witness in the present building with a series of specially-invited preachers and events including a flower festival. The church has served and witnessed to the community in Cookham Rise in many ways. When Rev Eddie Heap retired as Superintendent of the Windsor & Maidenhead Circuit in 1976, he and his wife Mary made their spiritual home at Cookham Rise. Both made enormous contributions to the life of the church. The Sunday School flourished under Mary's leadership in the 1980s. In 1987, Mary also played a leading part in setting up a church-sponsored playgroup — which continued until 2014 under the name Rainbow Pre-school. Mary's enthusiasm and indomitable spirit left one breathless, and her death in 1994 left a huge hole in the life of the church. Various activities have come and gone, but some such as the Ladies Circle and a Fellowship Group, have continued. Over the years the church has offered Children's Workshops twice a year — these have always been over-subscribed! 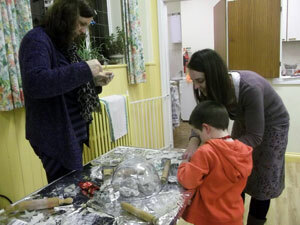 In addition, the church now holds Messy Church sessions three times a year. Cream teas in the summer months. All are much appreciated! Eating together is such an important part of the fellowship of the church! The replacement of the pews with chairs in January 2014 also opened up many possibilities, and the church is involved with the local community in using this flexible space. Within months, it was already used by an appreciative Toddler Group, and one Sunday evening each month, there is alternative worship, with its flexibility utilised to the full. 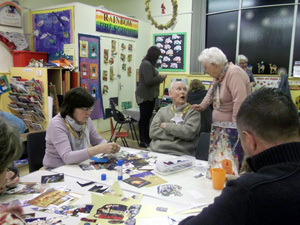 Details of our current activities are given on Cookham Rise's main page. 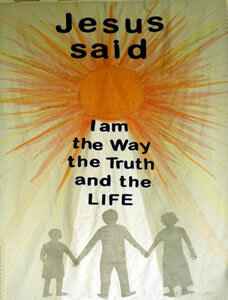 Two of the banners which hang in the church, serve as visual statements of the congregation's ongoing commitment and beliefs. The present and the future is summed up in the church's mission statement — to proclaim the love of God in Christ Jesus through worship and service to others in Cookham Rise, the surrounding area and the wider world. This history was written originally by Peter Hardiment, and updated by Connie Jeffery with the recent history of Cookham Rise.